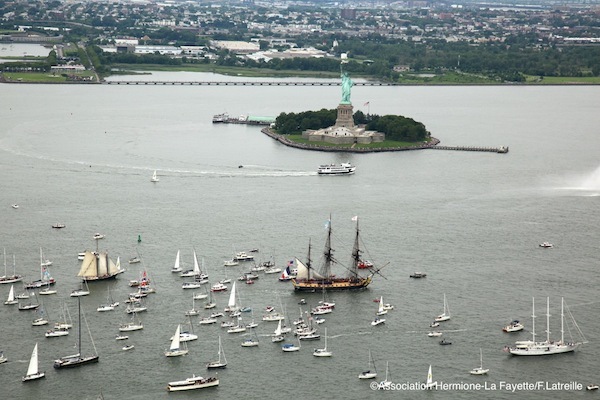 A replica of the tall ship L’Hermione leads a parade of ships to New York harbor. It was a fitting ceremony on the anniversary of American independence, and a reminder of the debt we owe to the French for our independence. The original ship arrived in Boston on April 28, 1780 with the hero of the American Revolution, the Marquis de Lafayette. He brought news of France’s financial and military support for the Revolution. Lafayette first came to America in 1777 and fought bravely for the American cause, most famously at the Battle of Brandywine (September 11, 1777). Lafayette’s Second Voyage to America: Lafayette and l’Hermione | Journal of the American Revolution.